adaptable topics imaginable – eggs. foundation. Literally. 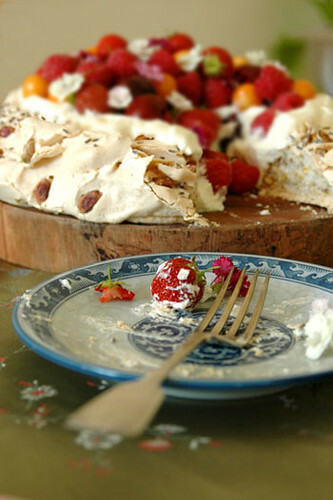 Yes, ladies and gentlemen, it’s a pavlova. Cookbook, written by Jerry Traunfeld, who is the executive chef at the eponymous Herbfarm Restaurant. part for its inclusion of lavender, my self-confessed goût du moment. afternoon to photograph while the light was still good. the fridge, what I have now is a soggy, fluffy, fruit-topped omelette. really no reason to not eat the whole thing straight away. fine sieve, stir in the vanilla, and chill until cold. be extremely stiff. Carefully fold in the chopped pistachios. airtight in plastic wrap and store at room temperature. around. 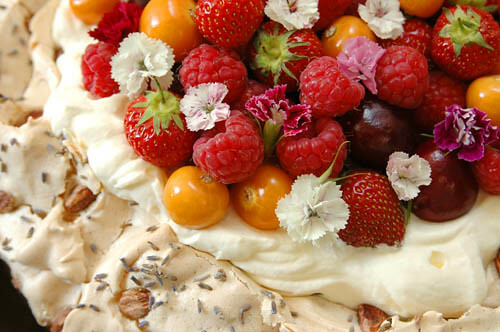 Arrange the fruit on top of the cream in an informal manner. in the fridge for up to 2 hours.